As a photographer, I believe I am led to make certain photographs. Whether consciously or unconsciously, I believe there is something that drives me behind that creation. I comply. I create. Inevitably when I try to create something aesthetically pleasing, occassionally I fail at it. To this point, I went out yesterday after work searching and sifting through the city looking for that image that spoke to me on a metaphysical level. I should mention I was freezing on my trek to make a photograph. Nevertheless, my efforts did not produce anything. I failed. This thinking has led me down a path synonymous with landscape and nature photography. It’s the flavor of the month right now. I’m enjoying this brand of photography. But I digress, back to my question of what in nature fails? As a human I fail at something everyday. Whether it’s at making a complete lesson plan that reaches every student or meeting my personal obligation to losing some weight, I fail in some area daily. As an artist I want to express that, but how? How can I express that through the medium of photography with nature as my muse? Where is the failure in nature? Is it accessible? How do I express my imperfection artistically? Lately, I have been a landscape photographer. My photographs have been laced with an artistic aesthetic of what I consider visually appealing. As one might expect, there is a gem that creeps in that I love. But what I did not expect was to create a photograph that spoke to my exact emotion at a particular moment. Today I was feeling some anxiety from a variety of things that stress me. I wanted to express that feeling creatively. This past weekend I went to Shelby Farms and walked one of their trails. I went with the intent of making a photograph. I was open to making whatever I saw that I deemed beautiful. When I walked up on this trail it spoke to me. I can’t explain it but trust me it did. As I grow in my practice of shooting I noticed that nature speaks to me. So my question is this, can nature speak to our moods, emotions, and shiftiness? Or was that a lucky portrait that I made that coincidently could be interpreted with an air of ambiguity. Can you be my muse? I want to know. Over the last several days, I have listened to several artists explain their work their students at SVA at NYC. It can be inspiring and humbling all in the same breath to hear their stories. I listened, intently and made a note of what they said to us. Artist like Elinor Carucci’s work jolted me and made me challenged my Americanized way of thinking about family and relationships. Her work is her voice in photography. I enjoyed the honesty in her work and candor. It reminds me to be true to myself and not to allow other people’s opinion, positive or negative, be the dictator of what I express through this media. There are times when I can be immobilized by other people and what they view photography to be. Like Elinor, I have to speak to my truth and let that work speak for itself. In saying that, Sasha Wolf’s lecture really drove the realities of my passion home. She says,”…stay true to form.” What she is saying is do not waste my time trying to be the next new, fresh and original cat on the street, artistically speaking. Be your unique creative self. She stresses one to be themselves and to allow their work to find its voice through traditional means. Even if it means creating portraits of everyday mundane things for as long as the form (technical, aesthetic and attention to detail) is paramount and is work that you can defend then create the work. She is a gallerist. Her business’s bottom line is affected positively and negatively by what she sells. You have to listen to a person who is invested on this level. Jen Davis spoke on the challenges of being overweight. She used herself as the subject. Again work that has an air of truth to it speaks to me. Whether it is staged or whimsical in its production is irrelevant because the honesty of the artist is on display. This is the type of artist that I am. I am a performative, staged digital photographer. Other artists that I listened to this weekend were Sean Perry, Robert Herman, Pixy Liao, Susan Bank, Jennifer McClure and Robert Tuschman. As I blog over time I will speak on what I took from their work. I have been working hard in my studio (creative space) over the last free five days. Being a school teacher occasionally affords you some bonus time off. We had some bad weather that closed the school system for several days. Most people run to the grocery store in this moment. I ran to the hardware store. I made several trips to the hardware store! lol. But getting into my creative space was/is one of my goals for this year and to create work on an artistic level. So with that prime opportunity, I began the process. The school system was awarded 5 days to offset the bad weather and hazardous street conditions. I worked in my creative all five days. What I learned was that preparation is everything. 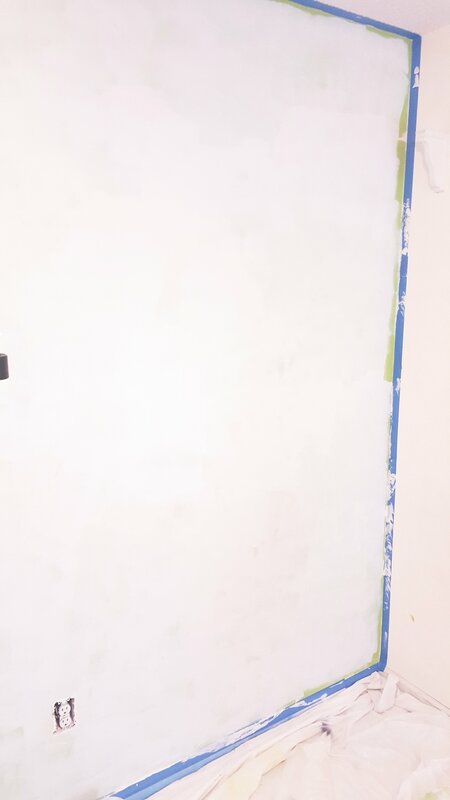 I spent more time outlining the walls, ceilings, baseboards, carpets, window sill, door trim, and doorknobs with painters tape than you would believe. Other things I did not anticipate was filling and sanding holes with putty. Needless to say, it was a timely undertaking. All this before I laid one coat of paint! As I said, prep was key to the whole process. I wanted the vital blue accent wall and the shades of brown to really have a clear voice and not be distracting. I believe I accomplished that. I am excited about my opportunity to build a body of work that expresses what is inside of me and space exclusively designated for me to do this in. Fast forward two hours. The primer has been drying for an hour at this point. I’ll let it dry for a few more hours and put a coat of vital blue paint up today. I’m excited about my progress! I am excited about my creative space. 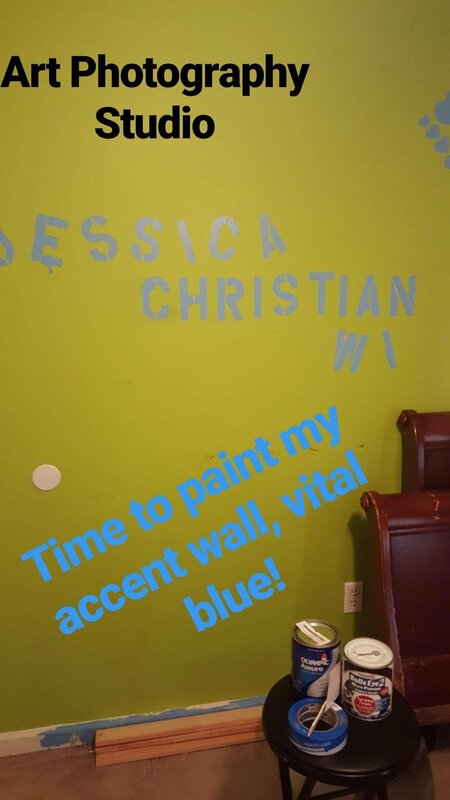 And I am psyched about the vital blue accent wall! For the longest time I have left twicksphotography.com on auto. What I mean is I did not do my part and update my website regularly with new work. I wanted to believe that the work I was getting was proof enough that my website was not a deciding factor in whether or not I would get jobs. From a professional standpoint, I was wrong. Maintaining my website should not be based on whether my clients frequent my website, it should be based on my standards for excellence and keep the site fresh. My resolution for this year is to be consistent in all things that I am currently involve in professionally and personally. The list is long, but know that maintaining my website is definitely a top priority of mine. I am in my home studio space. I am nervous. I am excited. It is freeing to have a place to express my thoughts and share my passion with those whose path may cross mine. Consequently, I do feel a huge weight on my shoulders to produce work that is speaks to what I see and feel as an artist. Nevertheless, I am encouraged to challenge myself in this open forum of creative potential. So what is possible in my 10 x 10 creative space? I am psyched by what I have readily identified. I believe there is so much more that I will discover once I begin the work!